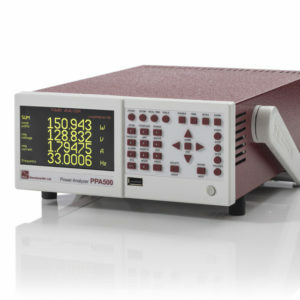 The PPA500 is a Precision Power Analyzer addressing a need for high performance power analysis at low cost. Primarily aimed toward applications that require precision measurement without complex features, the PPA500 series is ideally suited to a production or test environment. This power analyser achieves a level of performance previously available only in costly instruments, while maintaining the intuitive operation and clarity of measurement presentation for which the PPA series has become renowned. The unit benefits from a full colour TFT display that provides great flexibility and combines a level of performance, ease of use and value beyond any comparable product. While being only half rack width and 2U high, the PPA500 is available in 1, 2 or 3 phase configurations. As a result of innovative design, the PPA500 is able to deliver high performance at low cost. Features such as the planar shunt (A shunt design topology developed by N4L) and FPGA based real time no gap analysis technique all contribute to the PPA500’s fantastic offering. The low cost of the PPA500 Power Analyser presents a great opportunity to system integrators looking for accurate, traceable, reliable power analysis.